The presentation is the key to establishing a successful business, especially if you are new to the field. And if your business is online, then here is a roundup of the best WordPress product catalog plugins which surely will be of much help. There is no doubt that quality is crucial, but a new customer will make his or her first purchase based on presentation. So as you start your online business, your effort should be on improving the overall presentation. After that, you will see conversion rates automatically improving. 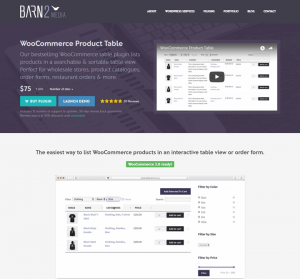 WooCommerce Product Table is a premium WooCommerce plugin which helps you to show product tables on your WooCommerce enabled WordPress website. It uses custom shortcodes for displaying different types of product tables and also manages to compliment them with a range of different options. This is an ideal tool for people running an eCommerce website such as a restaurant site, product review site, online wholesale store, and so on. It comes with a powerful filtering option which will help your customers fine-tune their search to arrive at the product they intend to purchase. However, you might be disappointed with one key drawback which is it doesn’t come with a dedicated button for WordPress visual editor. If it were present, the plugin would have made an entire package. An easy to use method for displaying product tables on your website. A lot of flexible shortcodes and extensions. A complete set of filtering options. Ajax powered buttons to search for products and to add them to your cart. Posts Table Pro is an easy to use WordPress plugin that organizes all your website content into a searchable and sortable table. This increases the overall presentation of all your web content, as well as makes them more available to your users. With the plugin installed, you can create a searchable table consisting off all sorts of content including but not limited to posts, pages, custom post types, documents, products, taxonomies, and even images, and videos. All of these can be arranged in a table complimented with an Ajax-powered search bar, and search filtering options by categories, tags, and other parameters which you are free to configure. You can display a featured image alongside every post as a thumbnail. This thumbnail can be configured to any size and can be position in any column. You can enable Ajax which will allow the plugin to lazy load your posts one page after another. This will significantly reduce the server load and improve your site’s performance. The plugin allows you to configure the tables by tweaking around with the column widths, default order, states the precise number of rows you want per page, and so on. Up next we have WordPress Catalog. The plugin is available for both, a paid and free pricing. And regardless of which subscription plan you chose, you will get access to all the standard features that will help you to build an online product catalog. There is a sufficient number of customization options along with useful features that will help you tweak your product catalog to compliment your particular niche. Now, it is worth noting that all the customization heavy features are saved for the paid model. For the free version, you get a basic, straightforward plugin. This isn’t necessarily a bad thing, as too many options can lead to headaches, especially for beginners. A search tool that supports a whole host of queries. Supports specific customization option for Images. Product Catalog is free to use WordPress product catalog plugin which packs in loads of customization options. Powered by the plugin, you can easily create a custom solution for a product catalog without even writing a single line of code. However, it isn’t solely targeted at WordPress beginners as developers can also spice things up thanks to the custom CSS support. Besides customization, the plugin also delivers on useful options including an Ajax-powered search tool, easy categorization of products, and much more. The catalogs can be filtered via URL which means you can list the products based on categories. A dedicated Options Panel allows users to quickly bring visual and functional changes. The plugin is also coded with best SEO practices so accept improved ranking on the search engines. WP Catalogue is yet another freemium plugin specifically curated to help webmasters to display their digital products in the best possible light. However, the plugin also comes with a downside that it doesn’t provide users with a great deal of customization freedom. You will get limited options to make functional changes. Everything is preset to a precise configuration – if you think you like its default look, go ahead and make the purchase. Again, if you like what you get with the free offering, you can go ahead and purchase its Pro version where you will get some new functionalities as well as performance and security-based enhancements. It comes with a drag and drop tool for easy configuration of your products under appropriate categories. You have the option to implement custom CSS to help make the UI more personalized and elegant. Everything has cross-browser compatibility, and works perfectly well, even on IE. So this was our roundup of the best WordPress Product Catalog Plugins. Hope you found this to be helpful. If you do end up using some of the plugins we discussed here, or if you have worked with them on a prior project, then remember to leave us a comment regarding your experience. Our users will love to know about the first-hand experience of their fellow users.